Last year my mom sent me a Boden catalog...I was in love. I saw myself wearing practically everything in there. I began ripping out pages frantically to see what looks I could try to create myself. 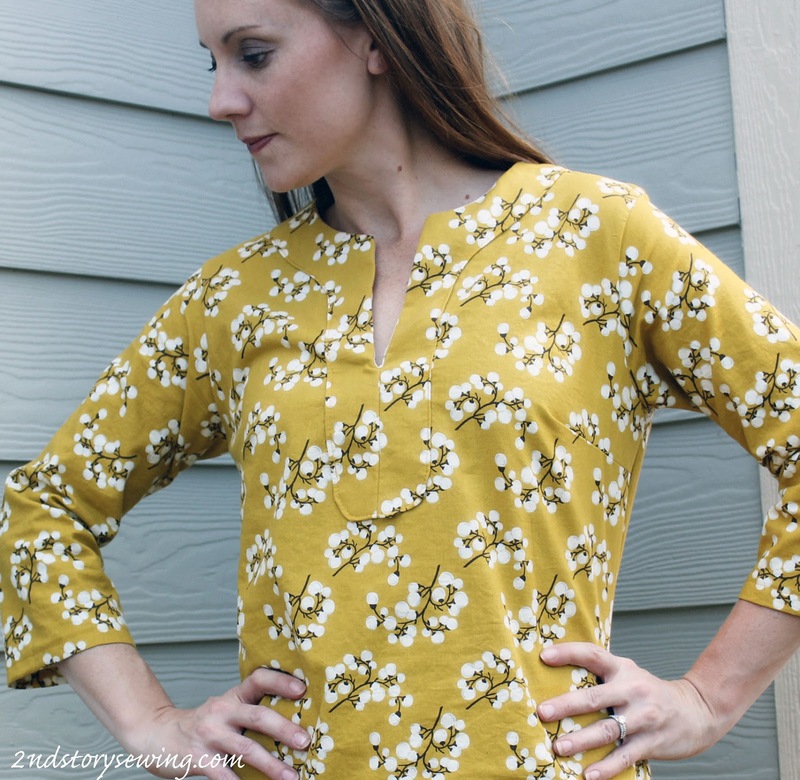 When I came across this yellow flowered tunic/sundress I instantly loved it. I found the mustard yellow fabric (Calico Print) at Joann's on sale and thought it could work. I would have loved it even more in a brighter yellow like the one in the magazine, but sometimes it easier to just use something you can find easily. I then used Simplicity 2696 to create the dress. I used View F with a few alterations. I lengthened the tunic to a dress length and added darts in the back to give it a little more shape. I also used the sleeves from my Schoolhouse Tunic pattern. You can see the Schoolhouse Tunic HERE, HERE and HERE. (tad obsessed...no?) Overall I am pleased with this dress. I kept sewing the front neck slit on crooked and ripped it out several times. In the end, it is still not perfectly straight but I became so frustrated I had to stop the madness and just go with it :) This makes for an easy spring or summer dress to toss on with sandals. This is so cute! Awesome, I love it. I love your dress - it's so gorgeously simple and elegant but fun at the same time - well done! 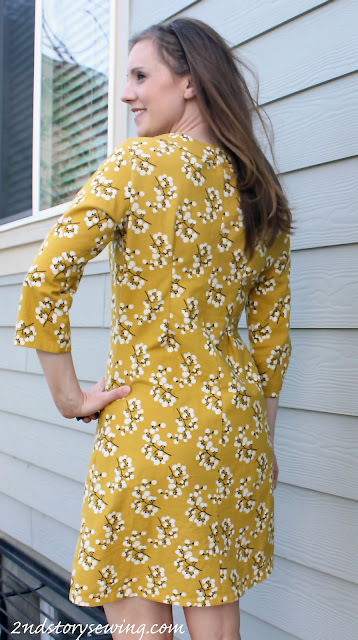 Really cute dress--I actually like your print/color better than the Boden one! Wait...you MADE this dress?? Wow!! I am super impressed!! It's time to open up an Etsy shop, I think! I often look to Boden for inspiration in my sewing projects - they have such cute stuff, AND on the rare occasions when I've bought something from them, it NEVER fits (at least the non-knit items). This turned out really well - beautiful work! Darling dress!!!! I love the style and the fabric...I totally want to make one for myself! Oh, very cute. I love Boden (and miniBoden!) as well. This silhouette is so simple and flattering. I am juuuuust eeking my way up to sewing for myself...seeing dresses like this make me want to do it a bit faster! Beautiful job! I think you beat Boden. Looks great! I think you beat Boden. Great dress! This is a lovely dress! The fabric print and color are so pretty. The arrival of a Boden catalog always has me tearing pages out for inspiration as well. 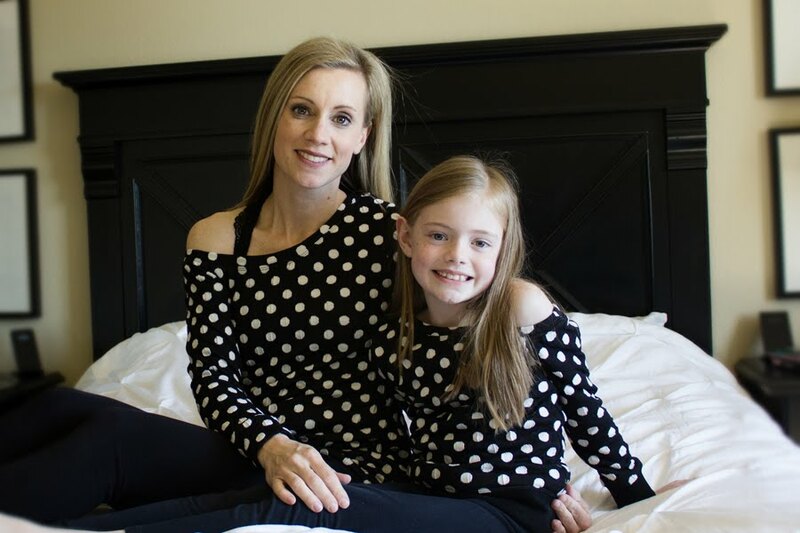 My last knock-off was for my daughter from Mini Boden. This is gorgeous! I love how classic it looks--and the fabric is to die for! Wonderful job! I loved all of you School House Tunic creations. When you find something that works well their is nothing wrong with getting as much as you can out of it. Fabulous job! Looks exactly like the Boden Dress. Love that fabric too :) Thanks so much for sharing with us at weekend Wonders! Hope you have a great weekend!